Members can use the services of to establish a new membership or to renew their existing membership in the National Duck Stamp Collectors Society (NDSCS). PayPal Members: For an NDSCS applicant who is already a member of PayPal, this is a simple transaction by clicking on one of the PayPal 'Add to Cart' buttons in the table below to initially join or renew membership in the society. The Membership Dues table below contains direct links to create a secure PayPal transaction for your membership payment. Click on the 'Add to Cart' button in the table below that corresponds to your membership payment option and a secure transaction is automatically created for you. When you are ready to proceed, just Proceed to Checkout and a few clicks later you are done. The shopping cart transaction is preformatted with all of the payment information about your membership  whom to pay and how much. You then instruct Paypal how to pay us. You can pay for your membership in any manner supported by Paypal (direct from an account or by using your credit card). PayPal credits the NDSCS and debits your account using a secure transaction on the internet. NDSCS does not receive any of your payment method information (e.g.  credit card number or bank account information). All of that sensitive information is secure and stays between you and PayPal. It is just that simple! Registration for international users is easy and free and all transactions are in US DOLLARS. Just pick your membership option from the table below and click on the 'Add to Cart' button, then "View Cart" to verify your selections and "Checkout." It is just that easy! Pick the choice that matches your yearly membership option. The National Duck Stamp Collectors Society has issued its own Conservation Stamps. if you'd like to add NDSCS Stamps to your order, please visit the Stamp Sales Page. 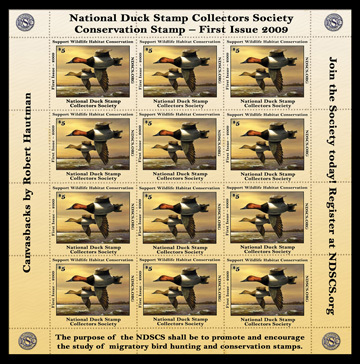 NDSCS Conservation Stamp First Issue 2009 illustrated below. PayPal has quickly become a global leader in online payment solutions with 40 million account members worldwide. Available in 38 countries around the world, buyers and sellers on eBay, online retailers, online businesses, as well as traditional offline businesses are transacting with PayPal.